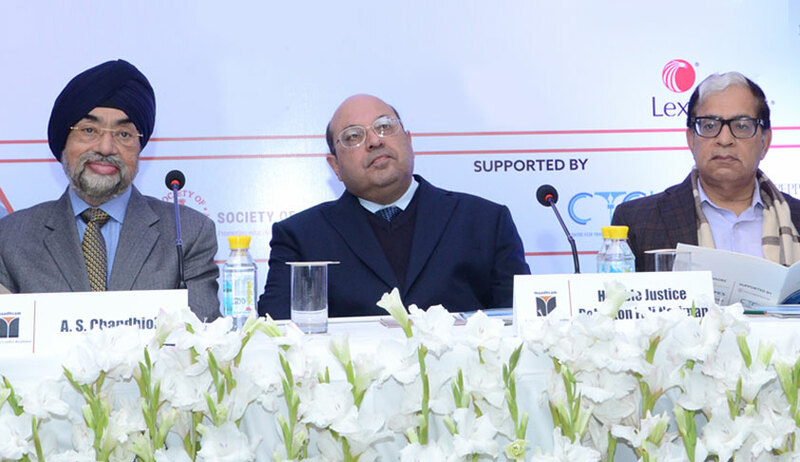 The International ADR Summit, 2018 organized by Maadhyam, The Council for Conflict Resolution, brought together members of India’s legal fraternity, academia and industry experts to propel conversation on its theme of ‘Building Bridges through Innovative Justice’. The three-day summit was flagged off by Mr. A. S. Chandhiok, President, Council of Conflict Resolution - Maadhyam in an inaugural address that discussed the relevance and virtue of Mediation and Arbitration. “ADR is here to stay because of its nature, efficiency and effectiveness in resolving disputes and conflicts. Mediation and arbitration has come a long way in India since the amendment in the Arbitration Act of 2015. Through this summit we hope to build a sustainable, inclusive and action-oriented community for mediation and arbitration in India,” he said. Thereafter, Mr. Gregg F. Relyea, International, Mediator, Arbitrator Trainer & Author from USA and Justice Arjan K. Sikri, Judge, Supreme Court of India, in their inaugural addresses, emphasized on the role and need of Mediation in changing rule of Law. Mr. Relyea also led a session, which concluded that negotiations are not strategic but partnerships are. He stressed on the viewpoint that patience is the key to a well-planned negotiation. Justice Sikri described the presence of mediation in India through various examples and said, “Mediation helps in removing the dust from the heart, bringing the parties land on a resolution or decision.” He further asserted that while judicial system decides who is right, mediation talks about what is right. Day two of the Summit was an amalgamation of panel discussions on relevant topics such as ‘Cross Border Conflict Resolution’, where Delhi High Court Judge, Justice Rajiv Shakdher hosted a mix of international and Indian experts, and highlighted the importance of International Mediation, cross border Mediation settlement, and Cyber Law and technology. Day two also saw discussions on intriguing topics like Commercial Mediation and the potential of MED-ARB as a hybrid model. Another session was conducted by Supreme Court Judge, Justice Sanjay Kaul, who steered the discussion towards acknowledgement of mediation being a process resulting in improved communication and clarified issues. The final day of the summit started on a philosophical and historical note, where Supreme Court Judge, Justice Rohinton Fali Nariman spoke about contemporary relevance of Gandhian philosophy. Further, Chairperson of the Law Commission of India and former Supreme Court Judge, Justice B.S. Chauhan led an insightful discussion on the theme, 'Building Bridges Through Innovative Justice', where the role of media and civil society in arbitration was brought to the fore. Delhi High Court Judge, Justice Manmohan then brought together a group of senior experts to debate the readiness of the Indian Arbitration and Conciliation Act, 1996 for tackling contemporary business realities. Delhi High Court Judge, Justice Jayant Nath steered the conversation towards showcasing India as a hub of arbitration by highlighting recent advancements made by the country in dealing with international arbitration. Fittingly, the last session of day three sought to shine light on the relevance of ADR in insolvency, where Mr. P. K. Malhotra, former Secretary, Ministry of Law & Justice, Government of India discussed relevant examples of its efficacy. The three-day summit concluded with a valedictory session by Acting Chief Justice of Delhi High Court, Justice Gita Mittal.